By Jennifer Burcke on July 8, 2012 Visit Jennifer's Website. In my recent post “How to Prepare for Successful Chick Brooding,” I shared my method of providing heat when brooding our first batch of baby chicks. We used a heat lamp and successfully raised those heritage breed hens. We are reaping the rewards every day when collecting fresh eggs from the nest boxes. When we decided to add a new batch of baby chicks this spring, I hoped that I could find a new method of providing supplemental heat in our brooding pen. In the process of investigating brooding equipment, I came across the Brinsea EcoGlow line of products. I was intrigued by the design and simplicity of the EcoGlow brooder. I was impressed by the energy efficiency. I was in love with the idea of being able to sleep through the night without worrying about fire safety or finding cold chicks in the morning. When the EcoGlow arrived, I was surprised at how light it was and impressed with its streamlined design. The product consists of a brooder panel, four adjustable legs and a power supply unit. A concise instruction manual illustrates how to set up the unit and suggests the most effective way to use it within the confines of a brooding pen. 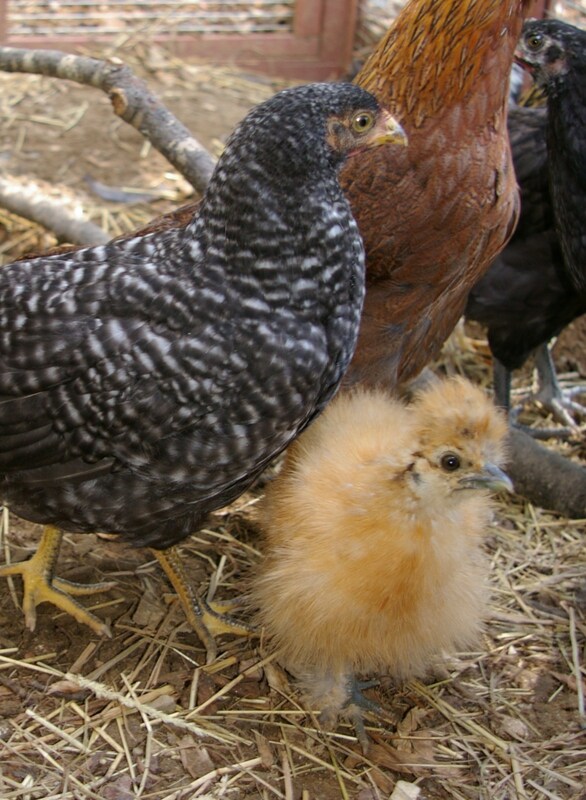 The brooder is offered in two different sizes. The EcoGlow 20 is recommended for brooding 20 or fewer birds, while the EcoGlow 50 is suggested for applications where up to 50 birds will be raised. Both models can be used for chickens, ducks, waterfowl or game birds. The two units are very similar, but this review will focus on the specific features of the EcoGlow 50, as it was the model that I evaluated and used on our farm. The EcoGlow 50 has four adjustable legs. They attach by simply threading the legs into the sockets in each corner of the brooder panel. Each leg is 8.75” long and allows the brooder panel to be attached at any increment along that length. The adjustability of the four legs allows the panel to be set to match the height of the birds in the brooding pen. The panel can also be installed in a diagonal fashion, allowing smaller birds to gather at the lower end and larger birds to comfortably brood under the taller end. 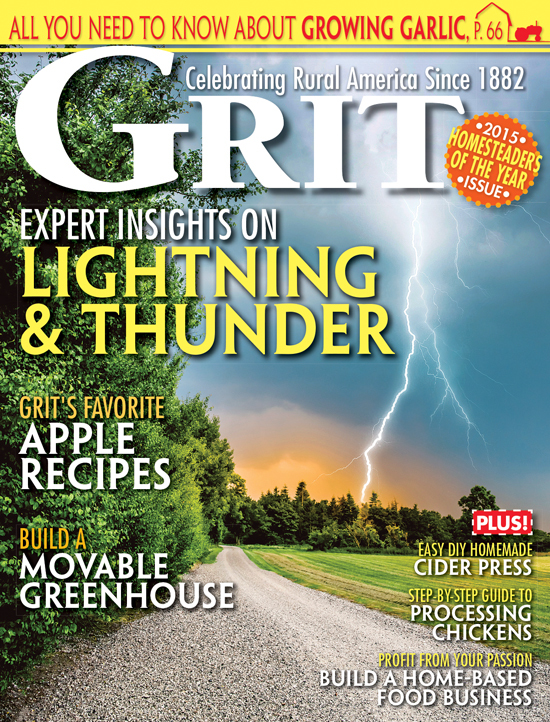 This feature was especially useful at 1840 Farm this spring. Our day-old chicks included an unusually large Welsummer chick and a tiny bantam Silkie chick. By adjusting the legs, I was able to provide both of them with a comfortable and safe brooding environment. The EcoGlow’s adjustable legs also allowed me to gradually lower the temperature for the chicks as they needed less heat. After the first week, I could simply reach into the brooding pen and rotate two of the legs a few turns until that end of the brooder had been raised slightly. The chicks could then choose how much heat they desired and move to the spot under the panel that provided it. 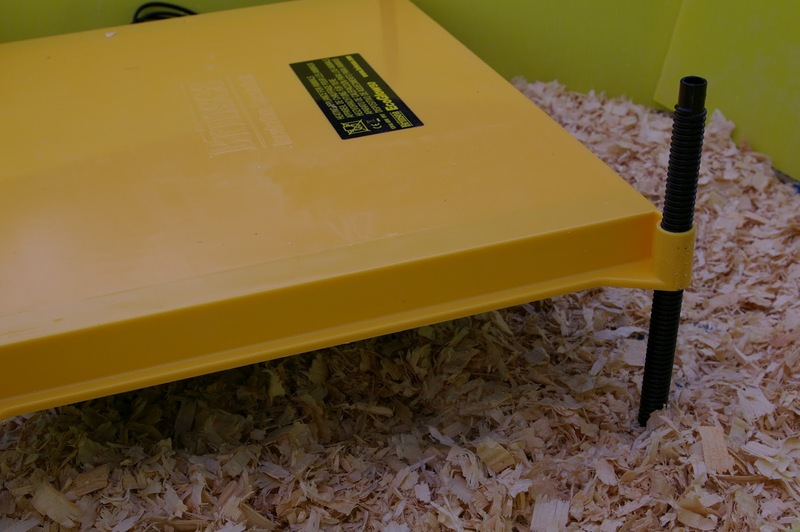 In practice, the radiant heat provided from the EcoGlow had the ability to warm the baby chicks snuggling underneath it without warming the brooding pen and the bedding contained within its boundary. I found this to be an incredible point of difference. In fact, at first, I worried that the chicks were not getting enough heat. I placed my hand on the EcoGlow panel and found the temperature to be similar to that of a heating pad. 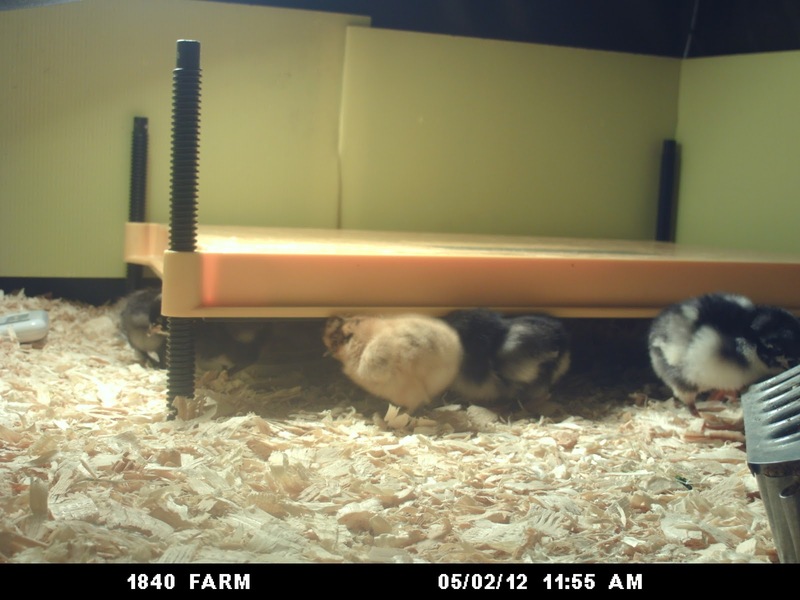 It was definitely warm, but not nearly as hot as the heat lamp I had used with our last batch of chicks. On the day that our chicks arrived this spring, it was rainy and damp. Our circa-1840 barn was anything but warm and inviting with a temperature of 57 degrees. I turned on the EcoGlow before we jumped in the truck to go retrieve our chirping package from the post office. When the chicks were placed in the brooding pen, they instinctively moved toward the warmth provided by the brooder. They scurried under the panel and stayed there. The chicks were comfortably unaware that the barn they were housed in was cold and uninviting. They were warm and comfortable. I observed them to ensure that they were warm enough. I looked for the telltale signs of cold chicks: huddling together for warmth. I am happy to report that our chicks did not exhibit that behavior. They were comfortably warm under the brooder. Now I knew that while only warm to my touch, the EcoGlow was providing ample heat for our day-old chicks. The EcoGlow also provided a benefit that I had never considered: It became the chicks’ broody mother hen. The panel design of the brooder allowed the chicks to take shelter underneath it just as they would if raised by a mother hen. They could relax, comfortable in the knowledge that they were safely underneath their source of warmth. As birds of prey, this seemed to be an incredibly calming influence in our brooding pen. To be honest, I had never considered this need when brooding our first batch of chicks in 2010. Looking back, those chicks seemed to become uneasy when someone approached their brooding pen. It’s perfectly understandable now that I think of it. Having someone tower over your brooding pen, casting a shadow into your little world must have been unnerving to them as tiny birds of prey. They had everything they needed: heat, food, water, clean bedding and branches to perch on. However, there was nowhere to hide: no mother hen to take shelter under. The brooding experience with this panel-shaped brooder was different. The chicks spent hours relaxing and sleeping under the warmth and protection of the EcoGlow. For the first few days, they spent so much time resting under it that it was difficult to catch a glimpse of them. They would exit the brooder to eat and drink and then happily return to the sanctuary provided by the panel. The smaller bantams gathered under the shorter end of the panel, while the larger chicks found their way to the taller end. There was more than enough room for all of them to be comfortable and warm. 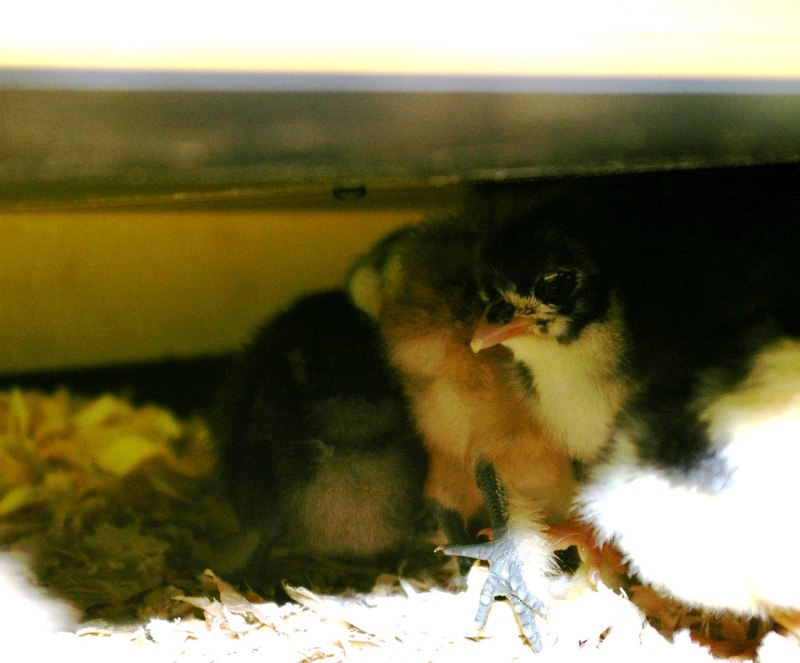 As the chicks continued to thrive and grow, I adjusted the legs to create more space underneath the EcoGlow. Mother Nature brought warmer temperatures each day and soon the chicks were warm enough in the barn to take up roosting on top of the panel instead of underneath. The top of the panel became a favorite place to take naps and listen to the sounds outside the barn. Eventually, I began unplugging the brooder during the daytime and then powering it back up at night to ensure that the chicks would stay warm during the night. As soon as the red indicator light came on, I knew that there would be plenty of heat to keep them comfortable all night. Once the weather was warm enough and the chicks were old enough not to need the supplemental heat, I chose to leave the EcoGlow in the brooding pen. It was clear to me that a few of the smaller bantam chicks preferred to retreat to the space below the panel when the larger chicks began to establish the pecking order within the flock. They seemed to soothe themselves by returning to the safety of the only mother hen they had ever known. The chicks have since moved to their small coop outdoors. They continue to grow and entertain us with their antics. They no longer need supplemental heat as Mother Nature has been providing plenty of warmth this summer. On the day that our chicks were transferred to their coop, I dismantled our leaf sweeper brooding pen and cleaned the brooding supplies. 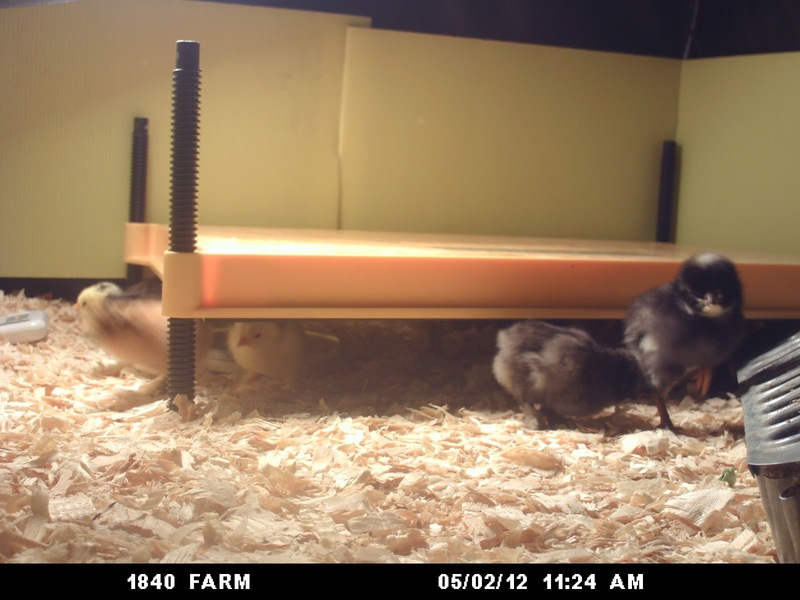 The EcoGlow wiped clean very easily in spite of the mess left behind by 10 baby chicks. I placed it in its shipping box, sealed the ends and stored it with our chick supplies in the barn.When I was in the process of cleaning the EcoGlow to pack it away, I began to wonder about the specific differences between it and our old heat lamp. I decided to compare them with regard to power consumption and the amount of heat emitted directly from them. I wondered just how different the temperature under the heat lamp and EcoGlow were. I had read about the energy savings promised in Brinsea’s product literature and wanted to see for myself just how much energy I was conserving by using their brooder. I gathered the EcoGlow, heat lamp assembly and bulb, the thermometer I use in our brooding pens, a wattage meter and my stopwatch. First, I tested the power consumption of the two heat elements. I plugged the Brinsea EcoGlow into the wattage meter. I allowed 10 minutes for the meter to register a reading that was stable. 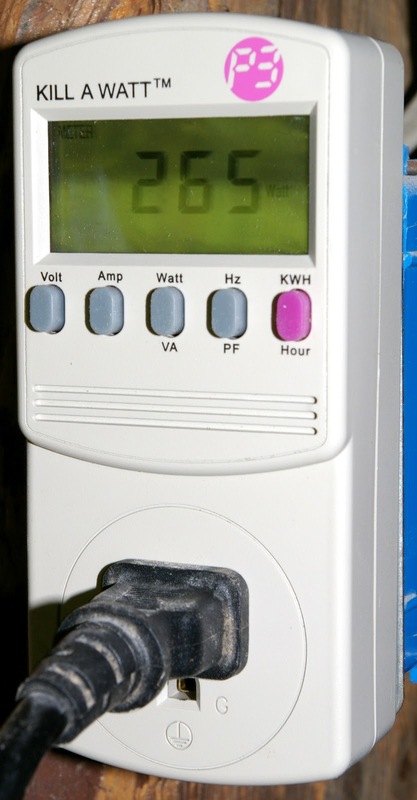 When using the wattage meter, the reading has a tendency to fluctuate. I wanted to allow enough time for the reading to come to rest. 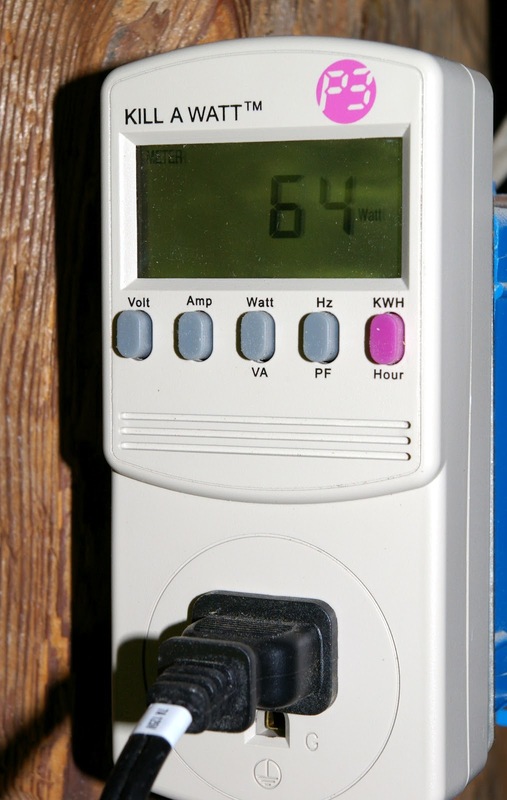 Once the time had elapsed, the meter registered a power usage of 64 watts. This reading aligned with the projected usage of 60 watts on the product literature. Next, I plugged in the heat lamp and waited ten minutes just as I had with the brooder. When I came back to record the reading, I was shocked to see that it was 265. The heat lamp used four times more electricity than the EcoGlow. That was a difference far higher than I had expected. With the savings in energy confirmed, it was time for me to measure the difference in the heat output of the two appliances. As I mentioned, the EcoGlow provides radiant heat to brooding chicks. 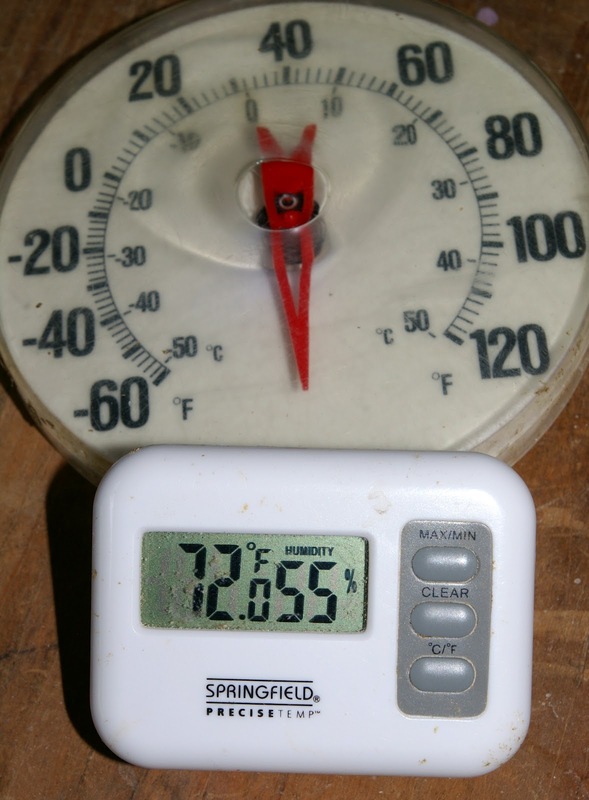 A thermometer placed underneath the brooder for several minutes consistently registered about 15 degrees warmer than a thermometer placed away from the brooder in the same section of the barn. The product literature states that due to the radiant heat, a thermometer will register a temperature between 5 and 10 degrees lower than that felt by a brooding baby bird. Taking that into consideration, a baby chick would have been warmed more than sufficiently while under the brooder. I moved on to the heat lamp. I plugged the lamp in and placed the thermometer underneath it. I looked at my stopwatch and as it hit the one minute mark, I looked back at the thermometer to check the temperature. The needle on the thermometer was displaying either -100 or 160 degrees depending on how I chose to look at it. The plastic face had developed a hole where it had melted from the intense heat. I turned the lamp off and set the thermometer aside. The barn thermometer registered 72 degrees while the brooding pen thermometer continued to cool off. Thirty minutes later, the thermometer had cooled off and was reading 60 degrees below zero. Several hours later, it had returned to normal and was displaying a temperature within 5 degrees of the digital thermometer.When using the heat lamp with our first batch of chicks, it was obvious that the lamp was generating intense heat. The brooding pen was always warm and the unheated garage was balmy given the fact that it was late September in New England. When adjusting the position of the lamp, I took to wearing an oven mitt to prevent burning my fingers. Even so, I was surprised that it generated enough heat to melt the face of the thermometer and warm the coil inside to the point of no return. When the time comes for us to brood another batch of baby chicks, I will certainly be unpacking the EcoGlow and situating it in our brooding pen. I’ll sleep easy knowing that our chicks will be warm and secure, with a heat source that provides them enough warmth without danger of overheating them or the flammable bedding in their pen. Then I can start worrying about important things like how I’ll introduce them to the grown hens in our coop. 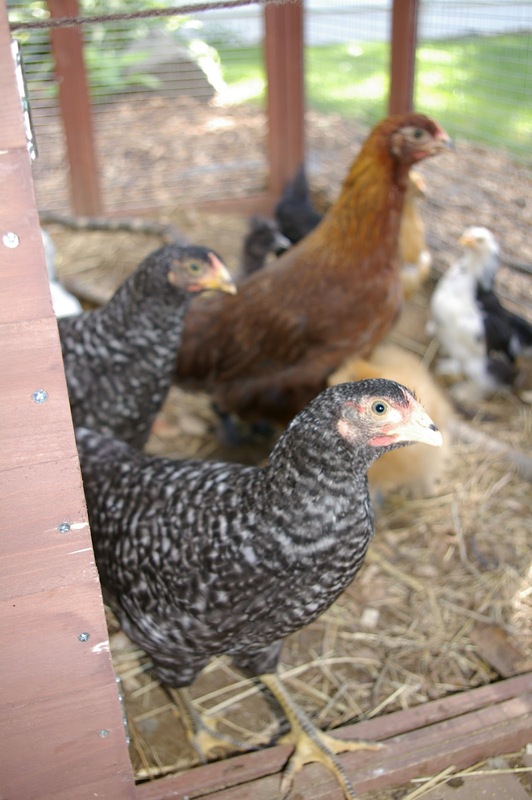 When I was in the process of adding a flock of heritage breed chickens to our farm, I found myself researching chicken keeping equipment on blogs and websites. I determined which products would be the best fit for my farm by reading reviews written by other chicken keepers. It is for that reason that I have chosen to review products here in this forum. It is my hope that my reviews will help prospective chicken keepers to determine which products might be best suited for use with their own flocks. Brinsea sent me a sample of this product in order to allow me to evaluate its performance on my farm. I did not receive additional compensation for writing my review. The review framework did not guarantee a positive review in exchange for the receipt of their product. This review contains both facts about the product and my opinion of its performance while being used at my farm. Just a quick note that “bird/s of prey” actually refers to birds that EAT prey, specifically raptors, not birds that ARE prey, like chickens. Otherwise, this is an excellent and informative article and has certainly piqued an interest in using the ecoglow brooder with our new chick’s in the spring! I have an EcoGlow 20 and was very happy with it for brooding Seramas and Blue Isbars last month. My only complaint with the 20 is that it does not have the legs you described for the 50. The 20 has two end panels with slots for just three different height settings. The heater unit snaps into these panels and it’s no easy task to get them into or out of the slots. I had to use a flathead screwdriver to get get them in and out and I was so worried I was going to break something. Regardless, I also felt it was a much safer alternative and who doesn’t love the fact that it’s so energy efficient. I have a question, as our chick are under an EcoGlow 20 and just arrived today. The literature says don’t use it if the room temp gets below 10 Celsius (50 Fahrenheit) and it’s supposed to get down to 40 degrees tonight. Should I turn a heat lamp on as well for supplemental heat? Thanks! Clearly this is exactly what I call a gorgeous blog article! Do you utilize this portal for your private purposes exclusively or you still use it as a source of income? I have an EcoGlow 20 and love it for all the reasons you state here. I think I’ll be buying another one before next spring. I also used it with our ducklings and they took right to it also. Great review!